The Beast with two horns like a lamb is a dual nation power like the two horned ram in Daniel 8:3, 20. Christian appearance like a lamb, but lying mouth as Satan the dragon. Formerly both nations preached liberty and rule of law, now ministers of propaganda whose black ops give life to the image of the Roman Empire Beast and do great wonders in its name. 12 And he exerciseth all the power of the first beast before him, and causeth the earth and them which dwell therein to worship the first beast, whose deadly wound was healed[i]. 13 And he doeth great wonders, so that he maketh fire come down from heaven on the earth in the sight of men . This is “another beast” (ἄλλο θηρίον) “of the same sort” (Vine). The interpretive key to this symbolism is also indicated by John’s being on the beach as was the Prophet Daniel when the Beast=Kings seen with their Kingdoms that arose from the sea (Rev. 13:1; Dan. 7:2-3, 17, 23). Therefore, the beast with two horns is to be interpreted as a dual nation power (Dan. 8:3, 20), no allusion to Christ at all for then it would have seven horns (Rev. 5:6). Once speaking “like a lamb” now it “spake as a dragon” depicting antithetical messages. Britain and America once preached liberty, the rule of law, as Christian nations they practiced charity on an unprecedented scale. Now they are on dark side speaking deceitful lies like their father Satan the Dragon. Once “like a lamb” harmless to others, now fire falls from heaven consuming the Beast’s enemies on the ground, their black ops giving life to an Quantum Computing AI personality patterned in the image of the Antichrist Beast Emperor of the Revived Roman Empire, slaying any who dare attempt to disconnect from its tyranny. The Chancellor representative of this dual nation Beast takes his position as the False Prophet for the (Rev. 13:11-17). The transition from the Beast Kingdom to the Ruler of it is seamless. Like before (Rev. 13:1-8) John doesn’t pause when his focus shifts from the (2342 θηρίον) beast/kingdom to the king of it, for “the remainder of this pericope (vv 11–18), it/he is referred to only by a series of eight third-person singular verbs (13:11[2x], 12[2x], 13[2x], 14, 16) and two occurrences of the pronoun αὐτός (13:14, 15). This figure is elsewhere referred to as the “false prophet” (16:13; 19:20; 20:10), which clearly conveys the role the author assigns him.-Aune, D. E. (1998). Revelation 6–16 (Vol. 52B, p. 755). Dallas: Word, Incorporated. The special relationship between the formerly Christian nations of Britain and America will strengthen until both united in purpose enough to share one representative standing with the Dragon and the Beast (Rev. 16:13) and fulfill the role of false prophet. John switches from past to present tenses in Rev. 13:12-18 to separate the ancient time wounding of the Babylon head in Rev. 13:1 from the Beasts wounding he suffers mid-week when his rebuilt Babylon city is destroyed, but he survives the hit. Ancient Babylon died a slow death as if by a plague becoming nothing but a heap of ruins sometime after the 7th century. The “miracle like” “healing”/rebuilding of the city of Babylon (using satanic technology [ii]) occurs in the end time week. The rebuilding gave the Revived Roman Empire Ten horn/king confederation a distinctly “miraculous” Babylonian flavor where the working of Satan in all power signs and lying are in full display. Globalists did more than lust for this New World Order; they fall on their face worshiping it, its Big Mouth Ruler, and the Dragon who made it all possible (Rev. 13:4-5). They are in globalist “New Age” ecstasy. During the end time week Babylon is destroyed suddenly and quickly by sword[iii] (Rev. 13:14) fulfilling all that was written in the OT prophets (Jer. 50:1-51:64; Isa. 13:1-14:23; 21:1-9) and discussed in Rev. 18:1-9. Evidently this destruction causes economic depression (Rev. 18:11). This sets up the perfect time for the New World Order of the Beast and his 666 membership only Economic system. Radical societal change often occurs during a crisis that otherwise would be impossible. That happens around the time the two horned Beast rises up with all the Dragon’s enhancements to his military and bio-technology (Rev. 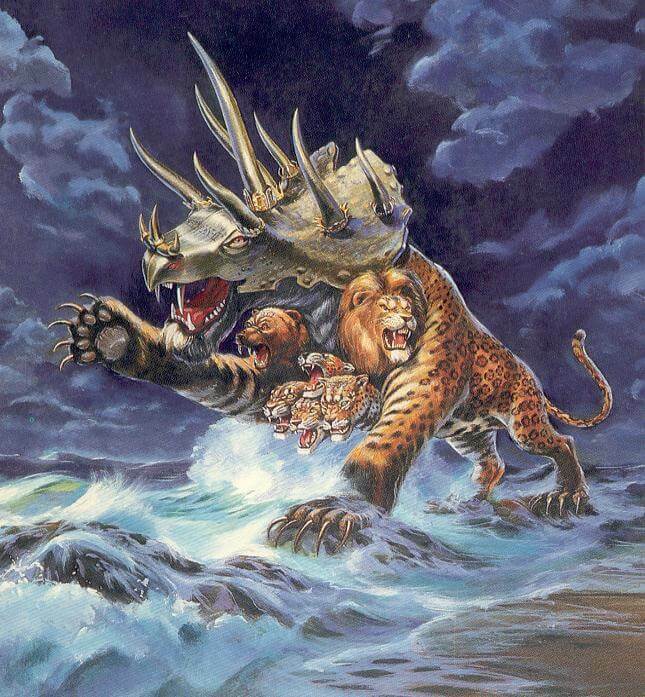 13:13) in support of the wounded Big Mouth Beast, and exercises Satanic power and authority on behalf of the “first beast” contributing to its surviving the blow, the “healing” of the sword wound (Rev. 13:12, 14). The possibility of world war, the world wide depression terrifies the earth (1 Thess. 5:3) and the Anglo-American False Prophet with their economic and military might convince a reluctant world to network with the artificially intelligent genetically modified life form connected to every internet enabled device, to create a membership only 666 economy. This “living image” is likely a Quantum computer with both the appearance and personality of the Big Mouth Beast. But it was a deception, rather than prosperity, peace and safety, it gives the Beast total control of their economies. It ends any hope of privacy. Via the network the world built forming the Beast’s Image, the Big Mouth ruler has godlike power to see and hear in real time everything occurring near an electronic device, and the power to kill all who resist. [i] The head was slain to death, ancient Babylon became a total ruin. The Revived Roman Empire Beast suffers a sword wound when nations out of the North destroy rebuilt Babylon, but it survived with the help of the Dragon, his Nephilim fleet, and military and technological might of Britain and America. [ii] Perhaps employing much of the same angelic technology that likely built New Jerusalem (Rev. 21:10-23). [iii] Although Dyer’s excellent study concludes the Great City Babylon is the Harlot Babylon, I must disagree. Having a name on her forehead indicates a relationship with Babylon the Great (Rev. 17:5) just as God’s name on the forehead indicates relationship with Him (Rev. 7:3; 14:1; 22:4) or the Beast’s name (Rev. 13:16; 14:9; 20:4) relationship with the Beast. See Dyer, C. H. (1987). The Identity of Babylon in Revelation 17–18 Bibliotheca Sacra, Vol. 144, (Part 1, p. 305; Part 2, p. 433). It is “great” because it spans history, from the Tower of Babel, sitting on many waters reigning over empires of the earth (Rev. 17:1, 18) as a “mystery” (Rev. 17:5) “below the radar” permeating the world’s religions, being the mother of religion for sale. The Holy Spirit revealed she becomes visible again the form of “that great city which reigneth” (Rev. 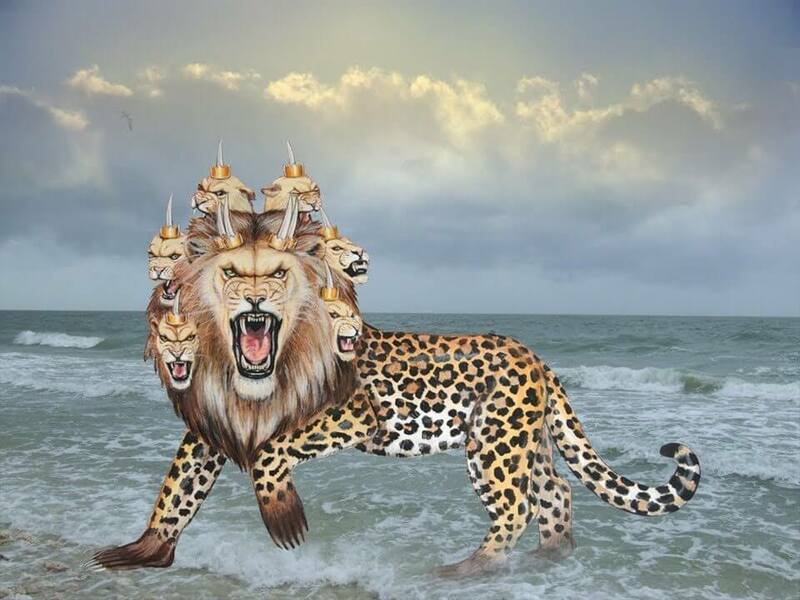 17:18) in the end time with the Beast, until he no longer requires her services. The ten horns/kings destroy (Rev. 17:16-17; 18:1-4) because the deified Beast no longer requires harlots religious services. It could be Babylon city itself is will be destroyed by a coalition of nations that perhaps includes Russia, Iran and Turkey (Jer. 51:27-29), precipitating the Harlot’s destruction.